Can I Build A Hobbits House In Ni? Anyway it got me thinking, Basically I have a site with outlline planning permission in a remote part of the country and I was going to let it lapse as I can't afford to build on it (and wouldn't want to sell it). This guy built this for £3K apparently + ~1500 hours of labour. Do you think I could ever get the planning department/building control give permission to do build something like this as a wee weekend retreat type place? I always thought building control are very strict so I'm guessing builiding a house for less than £10K will remain a pipedream. Thoughts? Why don't you write an informal letter to your planning office linking to the idea and ask their opinion? Its surprising what some planners will allow. Or have you thought of a mobile home or wooden chalet on the site? If you have outline it shouldn't be too hard to come to a compromise. thanks Doccyboy. I'm going to have a quick chat to an architect who helped me get the opp and then maybe approach the planning dept. Hopefully I won't get lauged out of the place! which is why many of the sites passed in the last few years are probably worthless at the mo in my view! So you saying my hobbit hole doesn't stand a chance of getting off the ground!? The main reason for letting the pp lapse is exactly as you have said - access costs etc. This project appealed as it would be a fun project with minimal outlay (if this guy is to be believed) and could be used as a weekend retreat. But then again maybe the problems associated with building something like this might make it not worthwhile. It looks great in the photos etc, but the reality even if pp could be surpassed might be a bit different. cheers for your thoughts. yeah need to speak to my architect. Isn't there some rule whereby if you build a house without full pp and it remains for 10 years then its automatically passed!? First of all, if you do nothing else -do not allow your planning to lapse. You may never be able to obtain it again. If you have Full planning or Reserved matters you just have to be able to demonstrate a lawful commencement of construction. If there is a garage then placing the foundations, providing there are no other pre-conditions will apply. Secondly, your Hobbit house appears to be underground. If your site had gradients to that effect there is a loophole in the system that allows you to build underground without planning permission. For example you do not need planning permission for a basement. However most people apply, or include it in the planning for their houses to enable the sale of the house to be easier. Thanks BVI. I was aware of the foundations loophole, but you seem to be implying that I would only need to lay some of the founds (i.e. the garage). Is this correct? If you have full permission or reserve matters approval and a garage is part of that approval, then the answer. The commencement of development must be lawful, therefore you require building control (if the BC Officer is willing to inspect on site then that is ok). You must also check on the pre-conditions. These will be in the approval conditions and will appear like. 'No development shall take place until ....' They usually refer to sight lines and perhaps the planting of a hedge. If they exist then you have to comply with them to consider your commencement of development as lawful. Keep all records of your concrete dockets etc. Would love to hear how you get on, great to see people doing something different. Good luck. you have to be living in it for four. You then can apply for retrospective permission. They normally apply to extensions etc. Wouldn't like to chance it on a complete build. 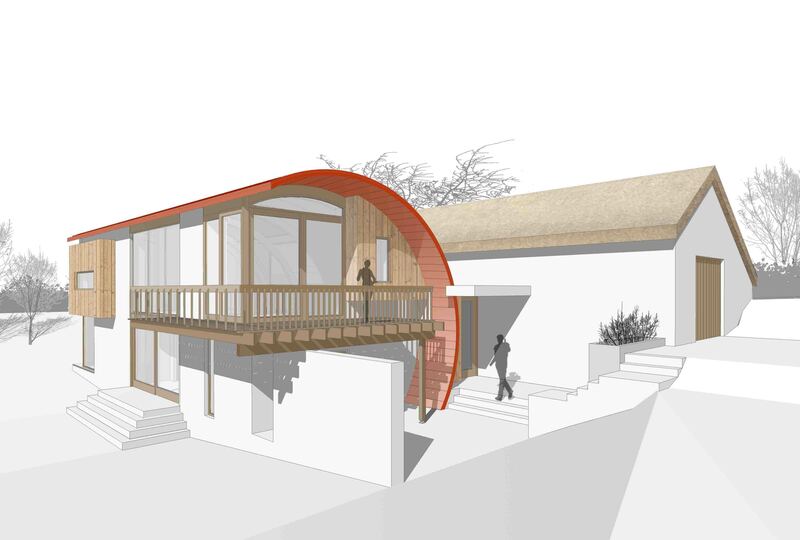 Building Control would not be the main problem, we have recently designed a straw bale house for an AONB (see image) and building control are more than happy about the construction, your main issue would be planning. Planners are eager to see Northern Irish Architecture reflect Northern Ireland and as such a hobbit house from the Lord of The Rings would be difficult to achieve. I would definitly not suggest looking for retrospective planning on this type of building, your best chance would be to put in a full planning application and hope that you get a responsive case officer who you can work with. I would suggest that serious negotations would be required in order to achieve an approval. If you decide to go ahead with it lets us know how you get on. Thanks for the clarification BVI and the extra info 2020. Assuming I can get something like this passed with full PP do you guys think something like this could be built for less than say £10K (assuming I take care of the labour and its made to be self sustainable - compost toilet, own rain water collection system, home made solar/wind energy to supplement a generator, etc etc) or would I just be asking for trouble long term with problems with rodents, rot, damp, cold etc? I'm not looking to build something to live in, but rather an alternative weekend retreat type place. Also with regard to planning, if you aren't actually living in the accommodation how does it work with planning? I mean if I was building a tree house for my kids or putting up a large shed I don't think planning is required, so when does it become necessary? I have recently written about permitted development rights in the Belfast Telegraph, permitted development rights (what you can build without planning) for home owners are slightly different from those of farmers. See below the permitted development rights for a home owner when it comes to building a small structure in your garden, if you are a farmer this is will not relate to you. With regard the building of this type of structure it would be the detailing, to ensure that the building did not leak etc, that would be the most difficult aspect; however, this type of building is not that unusal and in Cornwall where I used to work this type of self build was fairly normal. Many kinds of buildings and structures can be built in your garden or on the land around your house without the need to apply for planning permission. These can include garden sheds, garages, a car port, greenhouses or other buildings. In some circumstances you will need to apply for planning permission. You will need to apply for planning permission if any of the following cases apply on the land around your house.You want to put up a building or structure which would be nearer to any road than the nearest part of the "original house" and any road. The ground area covered by the building and any other buildings within the boundary of the property (excluding the original house) is more than half the total area of land around the original house. If your house is a listed building, and you want to put up a building or structure with a volume of more than 10 cubic metres. The building must not be used for keeping pigeons. Pigeon lofts need planning permission as does the use of an existing shed for keeping pigeons. Thanks for that 2020.It was an interesting read. The plot is actually on a family farm. I wrote about permitted development for farmers in my column in the farming life, see below for a copy of the text, again I hope that this helps. 2020 Chartered Architects are specialists in specialists in sustainable technologies and rural architecture. Regional Director Michael Howe, the senior architect in 2020 Chartered Architects Ballymoney office, is a member of the Royal Society of Ulster Architect’s and a member of the Royal Society’s Sustainability Committee. If you require additional information or wish to discuss a specific site please do not hesitate to contact our team in either the Belfast or Ballymoney Offices 028 276 67999. What development can I complete on the farm without planning permission? As a rural architect I am probably asked this question more than any other and although I have written about it previously, in the farming life, I thought it was worth outlining the policies again as the first in this series of Ask the Architect. The following is a simplified version of the planning department’s policies on permitted development rights, because of the individual nature of every site please seek professional advice from either the local authority or an Architect specialising in Rural Planning before commencing any works. Planning is not required for the erection, extension or alteration of a building and any excavation or engineering operations required for the purposes of agriculture within the farm business. Unless the development is on agricultural land less than 0.5 hectares in area or if the proposed building is more than 75m from the principle farm buildings or if the ground area to be covered by any proposed building exceeds 300sq metres or if the height of any part of the building is over 12m or the works consists of or include the erection, extension or alteration of a dwelling. Planning is also not required for the construction, formation, laying out or alteration of a means of access to a road unless it is required for a planning application or if the land is within a site of archaeological interest. It must be noted that these do not apply to engineering businesses or fish farms. If there are any issues relating to planning, architecture, farm diversification or sustainable technologies that you would like answered in a future Ask the Architect column, please do not hesitate to contact Michael at 2020 Architects Ballymoney.